The number of research outputs by Turkey-based academics decreased by 28 percent year-on-year in 2017, according to a recent report. Turkey had, before the post-coup purge of academics, approximately 150,000 academics, including ~22,000 professors, ~14,500 associate professors and ~34,000 assistant professors and some 80,000 teaching or research assistants, the report said adding that around 8,300 –6 percent– of them have lost their jobs in the aftermath of the July 15 coup attempt, the report said. The number of articles published in 2016, in journals indexed by SCOPUS database system, was 38,173, while the corresponding figure hit only 13,798 in the first half of 2017, the report said adding that the first-half-figure was multiplied by two to reach the extrapolated figure for whole 2017 which is 27,596. 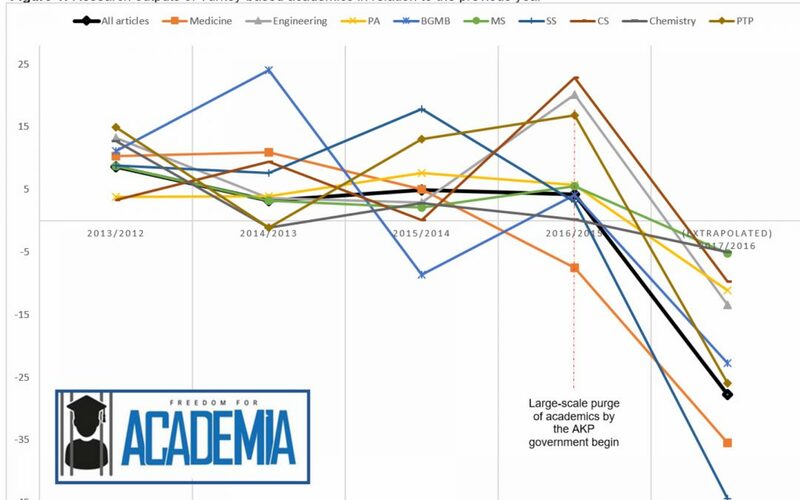 “We identified that there was a significant decrease (~28% on average) in the number of research outputs of Turkey-based academics in 2017, regardless of the academic field,” Freedom for Academia said. 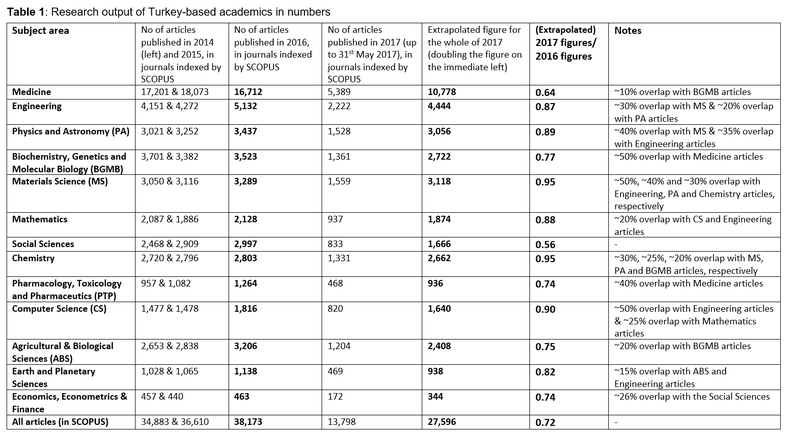 Sharing details about the research techniques employed in the study, the report said SCOPUS, the largest abstract and citation database of peer-reviewed literature was used to identify the number of academic articles by years and fields. The report also said the articles in the following fields in SCOPUS database were taken into consideration in the study: medicine w; engineering; physics and astronomy; biochemistry, genetics and molecular biology; materials science; mathematics; social sciences; pharmacology, toxicology and pharmaceutics; computer science; agricultural and biological sciences; earth and planetary sciences; and economics, econometrics and finance; and chemistry. “The most affected fields were the social cciences, and medicine, with a total reduction of 44 percent and 36 percent in the number of published articles by Turkey-based academics, respectively,” the report underlined. 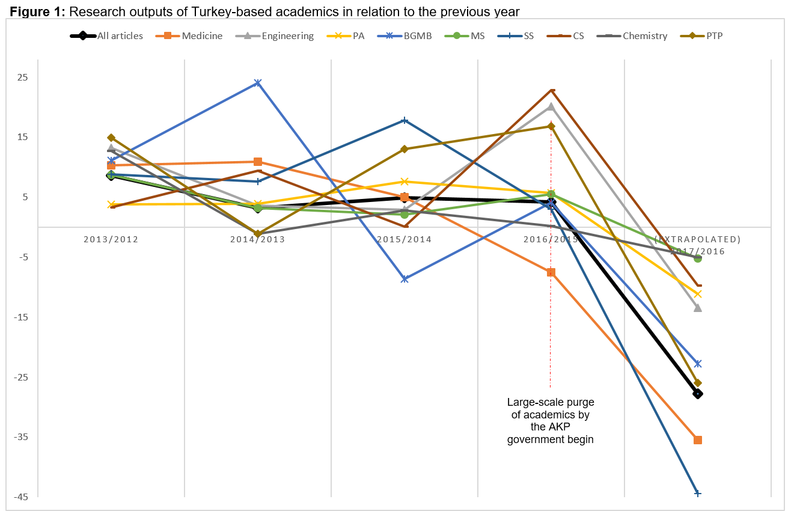 The number of sacked academics include those who have lost their jobs after the government closed their universities over coup charges. Turkey has closed down 15 universities over their links to the Gulen movement, which the government accuses of masterminding the July 15, 2016 coup attempt. Some 66,000 students were relocated after closures.